What do you do when your son is sick (not too sick) and stays home from school (sister stayed home too)? You make, you bake, you color, and you dig up old Martha Stewart Kids magazines (why oh why did they cancel them!?). 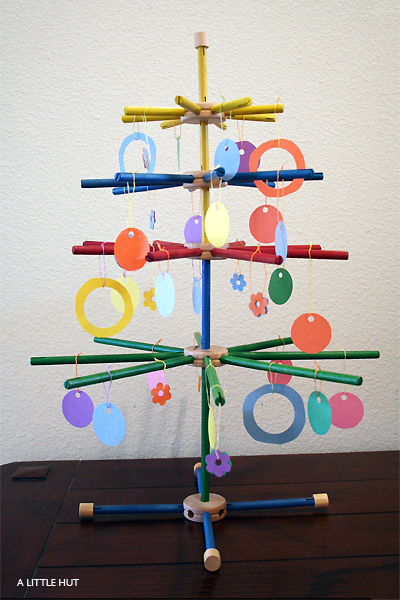 We love tinker toys but I definitely can't take credit for this tree idea. The 2005 Winter MS Kids magazine had this tree in there. The ornaments used in the magazine were beautiful colored buttons but since I don't have those we used construction paper instead. This was my little 'wreath' creation to accompany the tree. Mefuza tagged me for 5 random facts about me. Thank you for thinking of me Mefuza! 1. I used to know how to play the piano. I hated every minute of practice. I stopped playing when we moved (I was 10). 2. I had to do 5th grade twice. I was a good student but we moved from the US to Colombia at the time and the new school decided it was best for me to go through 5th grade again. The reasoning was that it would be easier for me to catch up with everyone else as far as spelling, reading, etc in Spanish. 3. I was the oldest in my high school graduating class (because of #2). 4. My dolls were my favorite toys as a child. My daughter now plays with what used to be my favorite doll. I didn't keep it purposefully. It somehow has just survived all the moving throughout the years. 5. When the time comes to have the "just say no to drugs" conversation with the kids my husband and I can both honestly tell them that neither one of us has ever tried anything - ever. By the way, my chalk lamp made it to The Artist's Magazine blog! Thank you. 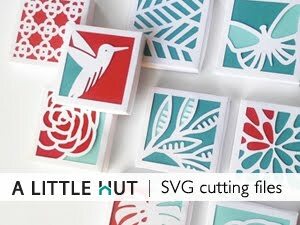 And thank you to those of you that have been mentioning my work and my calendar project: Brown Sugar Design (a creative husband and wife team of designers that do GORGEOUS work), Scribbit (there's a great list of projects in her post) and Fabulous-Fabulous (a lovely blog of all things handmade). I'm so flattered by all your kind words. Thank you so much! I can't believe this... my Sparkly Girl and I just completed our Tinker Toy tree last night. It was such fun playing with the sets that we haven't touched for years. I sympathize on reviling the piano. When I was eleven my teacher of five months told me "it might be wise if I pursued a different instrument." Oh, the burn! That tinker toy tree is awesome. I wish I could have one around without checking every five minutes to see if my cat had devoured it. 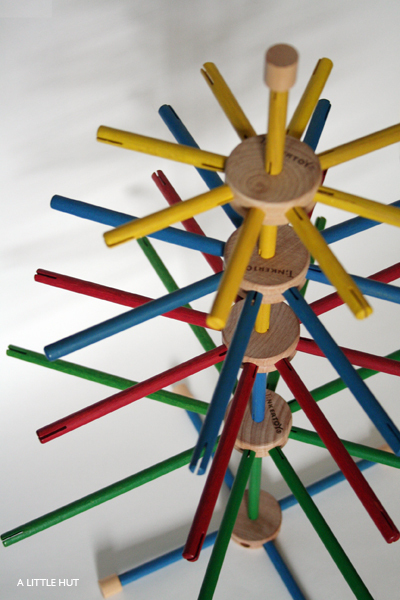 I love the tinker toy tree! It's got a wonderful, traditional feel to it! 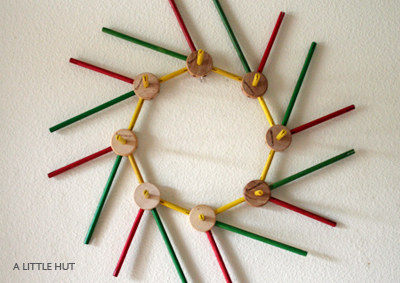 Ooo, I'm so glad you posted the Tinker toy tree idea. I have many MS kids magazines, but I undoubtedly didn't get the issue that had this idea in it. how i wish santa would bring me all the MSKs i don't have - lol. My 4 year old saw your pics and he had to make one too. Here's our tinker tree. Thanks for the inspiration. I was shocked, to say the least, when I found that MSK was no longer in production. I thought it was a wonderful mag!